The SparkFun MicroView is the first chip-size Arduino-compatible module that lets you see what your Arduino is thinking by using a built-in Organic Light-Emitting Diode (OLED) display. In the heart of MicroView, there is an ATMEL ATmega328P and a 64x48 pixel OLED display, together with other passive components that allow the MicroView to operate without any external components other than a power supply. It fits nicely into a breadboard to make prototyping easy. 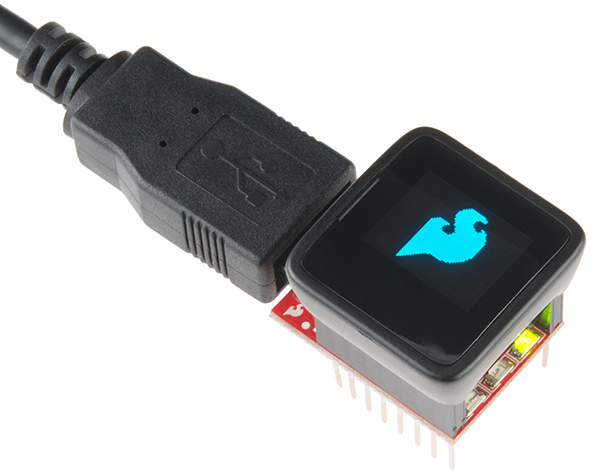 The MicroView also has a full-featured Arduino library to simplify programming the module. This guide will cover everything you need to know about the MicroView, including hardware information, quick-start experiments, library installation and usage, and advanced information such as making your own MicroView font. The MicroView is a stand-alone system. However, you will need an external programmer to upload new code to the MicroView. The MicroView USB programmer is sold separately, so you can purchase one programmer while purchasing as many MicroView modules as you need. If you do not have one already, you will need a MicroView USB programmer to follow along with this tutorial. 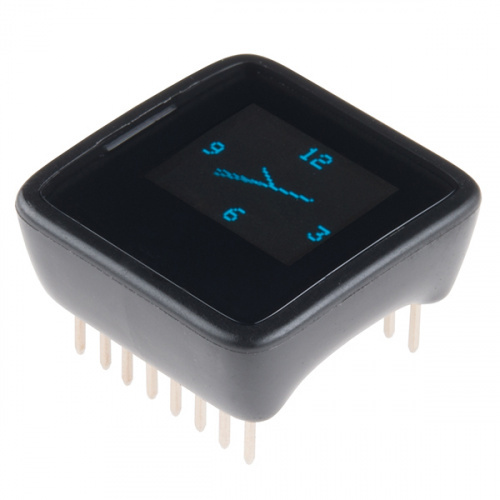 In addition to the MicroView and the USB programmer, you will need a few basic electronic components. Here is a complete list of the parts used in this tutorial. 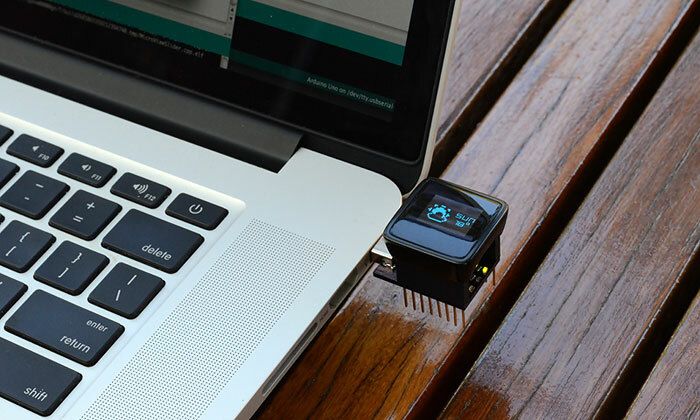 Note that the USB extension cord is not necessary; the MicroView USB programmer can plug directly into a USB port. However, your USB port may be difficult to access, may be too tightly spaced for the programmer, or may result in the MicroView appearing upside down to you. In these instances, the USB extension cable comes in very handy. We carry both a 1.5-foot version and a 6-foot version. If you have never worked with the Arduino development environment before or need a refresher, you may find the following links useful. How do I install a custom Arduino library? It's easy! This tutorial will go over how to install an Arduino library using the Arduino Library Manager. For libraries not linked with the Arduino IDE, we will also go over manually installing an Arduino library. What is this 'Arduino' thing anyway? A step-by-step guide to installing and testing the Arduino software on Windows, Mac, and Linux. How to install drivers for the FTDI Basic on Windows, Mac OS X, and Linux. 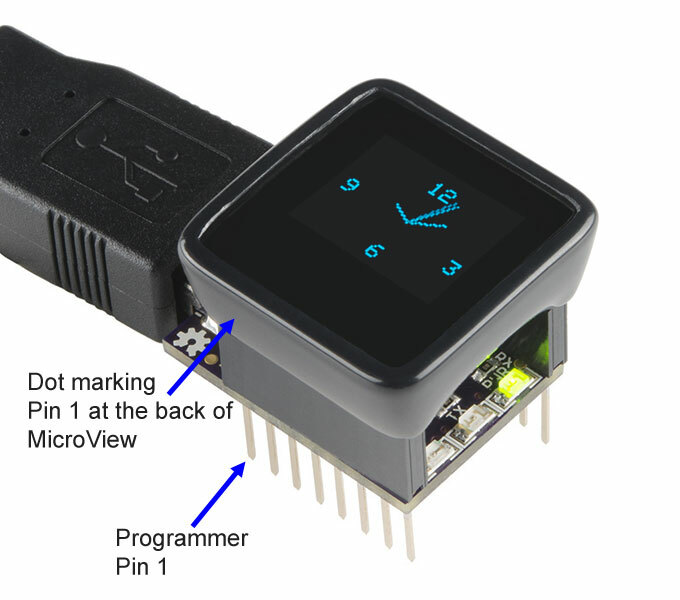 Let’s first familiarize ourselves with the MicroView and its pins. Below you'll find a list of specifications as well as a graphical datasheet detailing the function(s) of each pin. The MicroView has 16 "physical pins" that map to corresponding "Arduino pins" that can be referenced from within your Arduino sketch. For example, physical Pin 2 maps to the Arduino's Analog Pin A5. The pin numbering for the MicroView increments as you move counter-clockwise. The MicroView's physical Pin 1 is denoted by a dot on the underside of the MicroView. 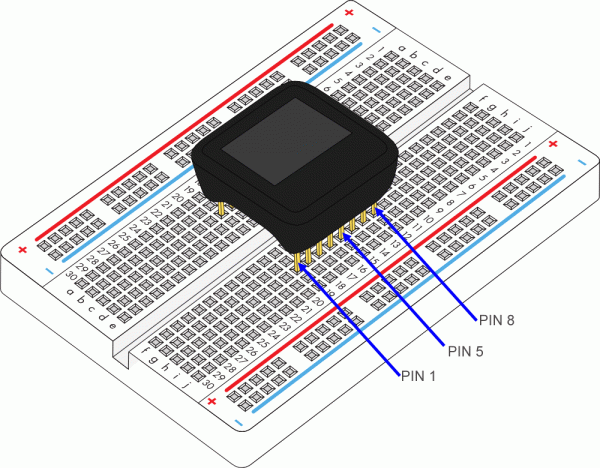 For more details on each pin's function, please refer to the ATmega328P Datasheet. The MicroView comes with preinstalled code to get you learning right out of the box without having to do any programming. Using just a few components, you can learn the ins and outs of the MicroView. Identify Pin 1 of MicroView based on the following diagram, or refer back to the MicroView Overview section. In this guide, when there is a reference for Pin X of MicroView, it is referring to the above diagram's pin number. For example, connect Pin 5 and Pin 8 of the MicroView. If this is your first time experimenting with electronics, you may want to read these other guides first. Welcome to the wonderful world of breadboards. 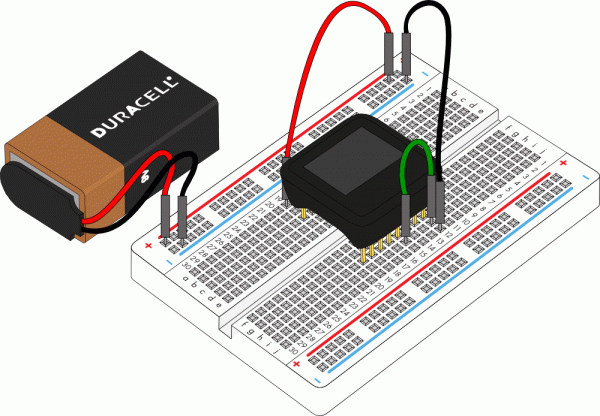 Here we will learn what a breadboard is and how to use one to build your very first circuit. A tutorial on all things resistors. What is a resistor, how do they behave in parallel/series, decoding the resistor color codes, and resistor applications. Learn the basics about LEDs as well as some more advanced topics to help you calculate requirements for projects containing many LEDs. An introduction to polarity in electronic components. Discover what polarity is, which parts have it, and how to identify it. The quickest way to get started is to use the USB programmer. Insert the MicroView to the USB programmer. Then connect the female end of the USB extension cable to the factory USB programmer. Note that it is much easier to connect a USB extension cable if the MicroView is inserted into the end of the breadboard. Connect the male end of the USB extension cable to the computer. The MicroView will power on, and the demo will start. Connect the required parts based on the diagram below. Plug in the battery connectors last. Once plugged in, the 9V battery will power the MicroView through the VIN pin (PIN 1). As soon as the MicroView is powered, the demo will start. The MicroView comes pre-programmed with a few simple built-in tutorials to help you get use to inserting jumper wires, resistors and an LED. Skip these tutorials if you are already familiar with them. They will begin after the visual demo. 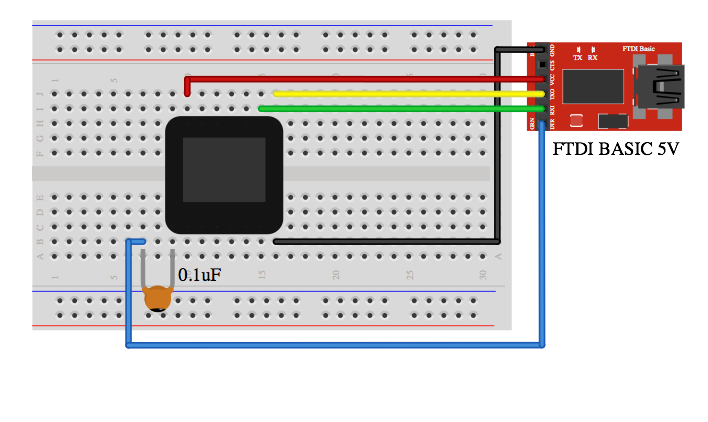 Note: The following examples are based on MicroView without the USB Programmer, if you have the USB Programmer, please ignore the battery, red jumper and black jumper. The MicroView gets its power supply from the USB Programmer via the USB cable connected to the computer. Once you have successfully connected PIN 5 and PIN 8 of the MicroView, a “Well done!” message will be displayed. To proceed to the next simple tutorial, remove the jumper. Once you have successfully connected PIN 3 and PIN 8 of the MicroView, a “Well done!” message will be displayed. To proceed to the next simple tutorial, remove the jumper. Once you have successfully connected PIN 2 and PIN 8 of the MicroView, a “Well done!” message will be displayed. To proceed to the next simple tutorial, remove the jumper. Once you have successfully connected PIN 4 and PIN 8 of the MicroView with the resistor, a “Well done!” message will be displayed. To proceed to the next simple tutorial, remove the resistor. With the resistor still at the same place, insert an LED with both of the pins at PIN 4 and PIN 5 of MicroView respectively using the following diagram as reference. Note: LEDs are polarized components. Make sure you insert the LED in the correct orientation. The MicroView is able to detect if the LED is inserted with the correct polarity, and it will begin blinking the LED. If the LED does not blink, remove the LED and turn the pins the other way round and connect them to PIN 4 and PIN 5 of the MicroView. With that, you are now ready to upload code and begin building the experiments in this guide. If you would like to load the Demo Sketch back on to the MicroView after you have uploaded any other code, you can find the MicroViewDemo.ino sketch in the MicroView Library Examples. 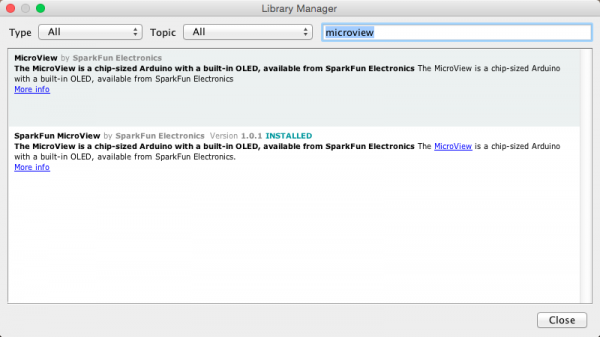 The following section will cover all of the instructions to install the MicroView library and get started using the MicroView with the Arduino IDE. If you have never used an Arduino or Arduino-compatible device on your computer before, you'll likely need to install the drivers for the FTDI chip located on the MicroView USB programmer board. If you have never installed an FTDI driver before, please visit our FTDI driver installation tutorial. Once successfully installed, your MicroView should show up as a valid COM port in the Arduino IDE under Tools -> Ports. On a Mac or Linux machine, it will appear as /dev/cu.usbserialXXXXXX, where the X’s are some specific characters and numbers. On Windows, it will appear as COMXX, where the X’s are a specific number. Once you have finished the FTDI driver installation, you will need to prepare your MicroView to be inserted into the computer’s USB port. If you're using the USB programmer, insert the MicroView into the USB programmer now. 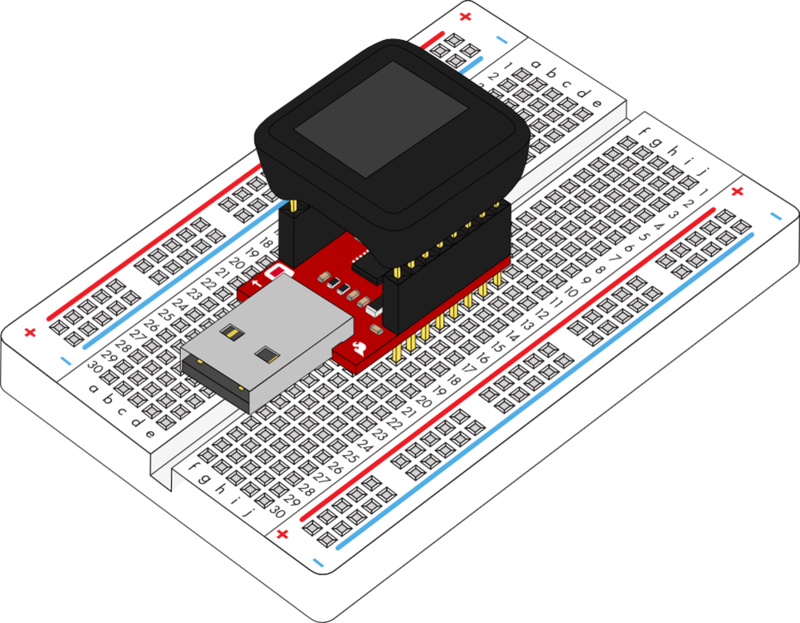 Be sure to align Pin 1 of the MicroView with Pin 1 of the USB programmer. Once you have inserted the MicroView into the USB programmer, you can insert the USB programmer into the USB port of the computer as pictured below. If your computer does not have a right-sided USB port, please use a USB Cable Extension to extend the USB port to the front so that you can easily work with the MicroView. 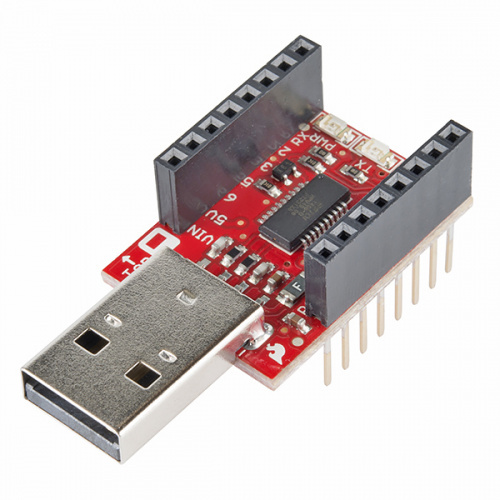 As an alternative to the USB programmer, you can use a 5V FTDI Basic breakout or 5V FTDI cable instead. Connect the FTDI Basic breakout board as shown below, and you are ready to go. If you have not installed the Arduino IDE already, now is the time to do so. Visit our Installing Arduino IDE tutorial for detailed instructions. Download the library using the Arduino Library Manager (found in all versions of the Arduino IDE from v1.6.4 and on). Click Sketch -> Include Library -> Manger Libraries to open the Library Manger. Once open, type "microview" in the search field. 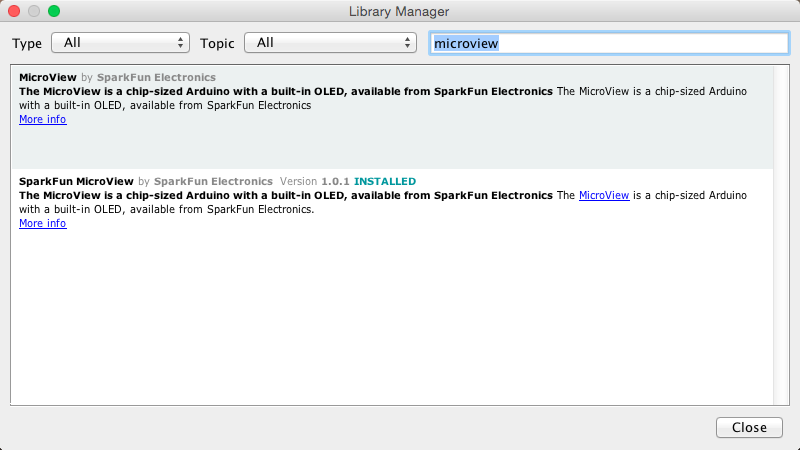 Install the SparkFun MicroView library by clicking on the library and then clicking the install button. Once installed, there should be a blue "installed" indicator next to the library. You should now be able to find all the MicroView examples in your Arduino IDE sketchbook. Once the Arduino IDE is up and running, you'll need to select the correct board. Luckily, the MicroView is supported as an Arduino Uno variant, meaning no extra .brd files need to be installed to use the MicroView. Select Arduino Uno under Tools -> Boards. In the Arduino IDE under Tools -> Ports, select the correct COM port. This is the port that was found in the Driver Installation section. For advanced users who like to see MicroView as a board by itself in the IDE, add the following board definition to the boards.txt file. Depending on your setup, the boards.txt file is usually located in the arduino-version\hardware\arduino folder. Replace arduino-version with the right folder name for the Arduino version installed in your computer. With the drivers and library installed and the correct settings selected in the Arduino IDE, it's time to run our first program on the MicroView. The "Hello, World" sketch in the next section will be the first code we upload to the MicroView. Example 1 - Hello, World! The "Hello, World" sketch is common for programming of all types. For most embedded electronics, blinking an LED is the equivalent of printing out a "Hello, World" string. However, since the MicroView has its own display, we can actually print "Hello, World" to the screen as our first program. Copy the following code, paste it into the Arduino IDE and click upload. Alternatively, you can open the HelloWorld sketch found under File -> Examples -> SparkFun MicroView -> Learning Kit -> HelloWorld. Once uploaded, you should see "Hello, World" print out on the OLED screen. Congratulations! You just uploaded your first MicroView sketch! Let's see what else we can program. In this example, we're going to try some basic drawing. This sketch demonstrates the MicroView's many drawing functions, including pixels, lines, circles and rectangles. It also introduces the setCursor() function, which allows you to move the cursor and print text or draw shapes at different locations other than the origin (0,0). Copy the following code, paste it into the Arduino IDE and click upload. Once uploaded, you should see various images appear on the display. Check out the MicroView Class Reference page for more information on drawing. This example introduces one of the MicroView's most powerful programming tools: the widget. This sketch uses both the MicroViewSlider and the MicroViewGauge. These widgets are useful for displaying information from sensors, timers or other hardware, such as buttons or knobs. Once uploaded, you should see a slider widget and a gauge widget run through the values 0--100 in a repeated loop. Check out the MicroView Class Reference page for more information on widgets. This last example shows how to draw bitmap images to the MicroView. This is useful for creating splash screens of company logos, making sprites or just creating fun graphics for displaying information. Create a blank image in your favorite drawing program (Inkscape, Photoshop, Paint, etc. ), setting the canvas size to 64x48 pixels. You can then draw your image by hand. Find an appropriately sized image on the Internet. Use a program to take an image and convert it to a bitmap. 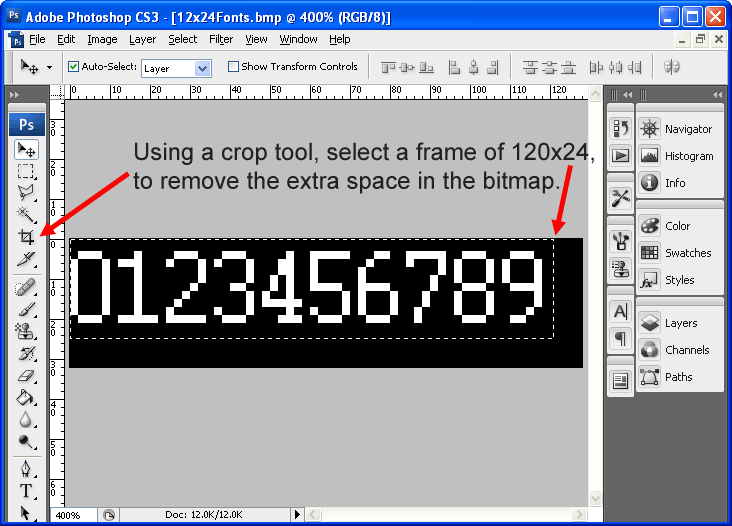 Detailed instruction on how to make bitmap images is beyond the scope of this tutorial. Once you have a bitmap, it's time to convert it into an array that the MicroView can understand. You can use programs such as LCD Assitant (Windows only) or this homebrew conversion program (any OS that runs processing), created by SparkFun customer George Beckstein to convert your image into an array. With your array created, paste it into your code. Be sure to name it appropriately. Then call your array inside the drawBitmap() function. //to an array is to use the LCD Assistant linked above. Once this is uploaded, you should be greeted by a familiar fictional character. There are several other example sketches included with the MicroView library. Try loading some of these other examples and figuring out what the code is doing. This section goes into more detail about how the OLED screen functions and how the MicroView library works with the screen's controller. Read on to get a better understanding of how the MicroView prints and draws to the OLED screen. The SSD1306 is the controller built into the MicroView’s OLED display. It has flexible yet complex segment and common drivers. Vast knowledge on memory addressing is required in order to use the SSD1306 controller. MicroView’s library was written to hide away the complexities of the SSD1306 controller so that users can issue simple commands to control the display. Although the SSD1306 has a built-in RAM (memory) for the screen, when connected using the SPI method, the ATmega328P is not able to read the RAM (memory) of the SSD1306. Therefore, the software will not be able to manipulate the screen buffer to perform mathematical operations. MicroView’s library overcomes this by allocating 384 bytes ( (64x48)/8 bits) of memory from ATmega328P as buffer. The library can now manipulate the screen buffer and then perform a bulk transfer from the ATmega328P’s memory to the internal memory of the SSD1306 controller. and are arranged in a linear form representing the following 64x48 pixel coordinate system. This command would then calculate the exact location of the screen buffer and set a BIT in the corresponding BYTE to the X,Y position. Diagram showing how a linear screen buffer in the ATmega328P aligns with the OLED pixels. 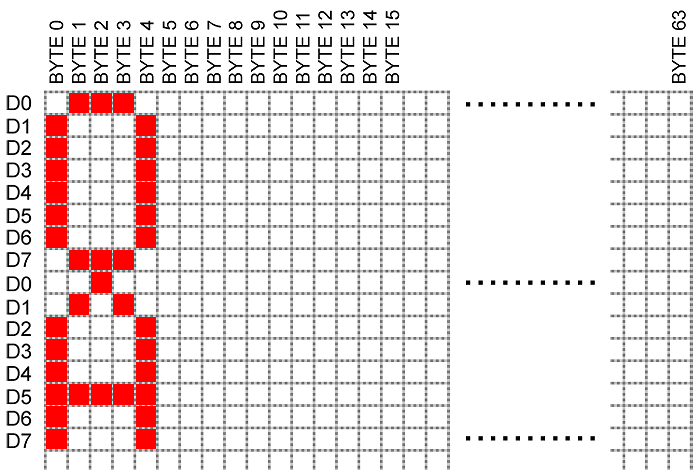 Diagram showing the BITs in a BYTE of the screen buffer corresponding to the OLED’s X,Y position. 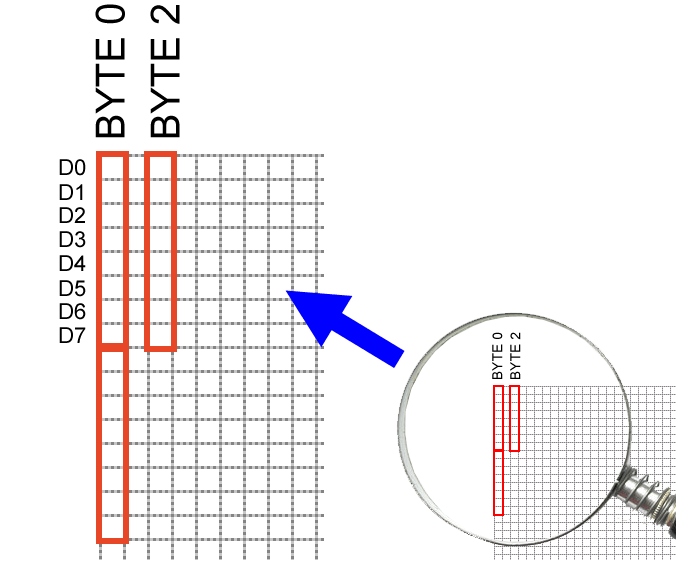 Based on the above illustration, a pixel turned on at X=2 and Y=3 means BYTE 2 of the screen buffer has data of 0x08 (hex). 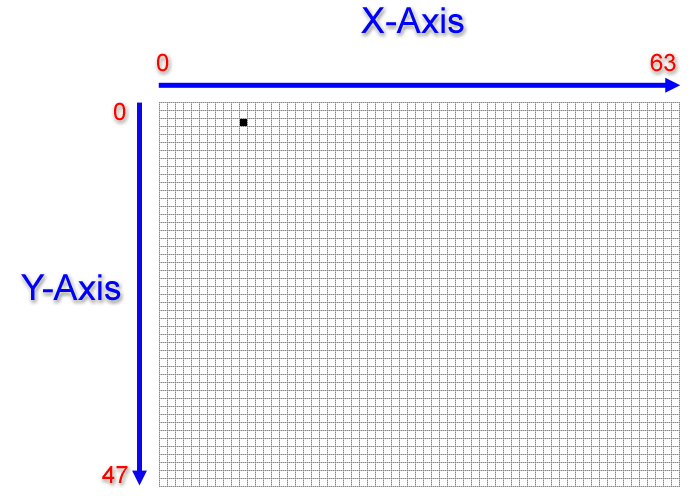 Two pixels at X=2,Y=3 and X=2,Y=2 turned on means BYTE 2 of the screen buffer has data of 0x0c (hex). The following C code shows a pixel-by-pixel way to draw a straight line of 5 pixels starting from 10,2 to 10,6. This function takes the whole screen buffer in the ATmega328P and transfers it (via SPI bus, programmed at 8Mhz) to the internal memory of the SSD1306. As soon as the memory is being transferred, the pixels corresponding to the screen buffer will show up on the OLED display. Though there are several different fonts that come programmed into the MicroView, you have the option to create your own fonts! Read on to find out how to do so. In the OLED Memory Map section, we covered how the MicroView library allocates 384 bytes of RAM as screen buffer from ATmega328P to perform graphic operations before transferring this block of memory to the SSD1306 OLED controller’s memory. The following diagram shows how two 5x8 pixel characters are drawn on the screen buffer. 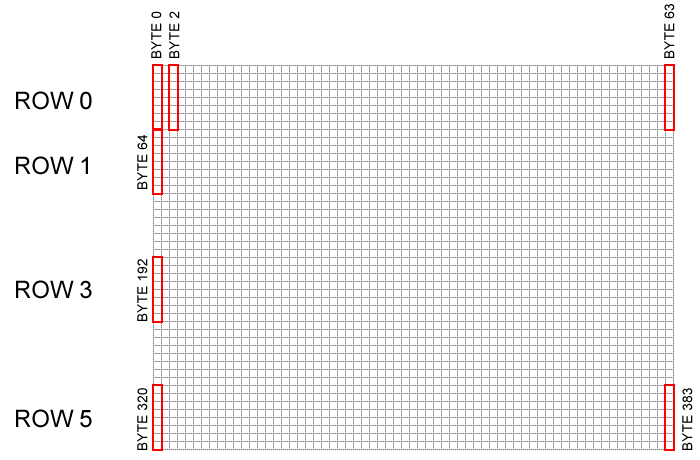 With the 8x16 font using RAM from screen buffer’s ROW0 and ROW1, the data of the above diagram will occupy the screen buffer’s BYTE0 – BYTE7 and BYTE64 – BYTE71. Generate font source file from bitmap. Add font source file to MicroView library. 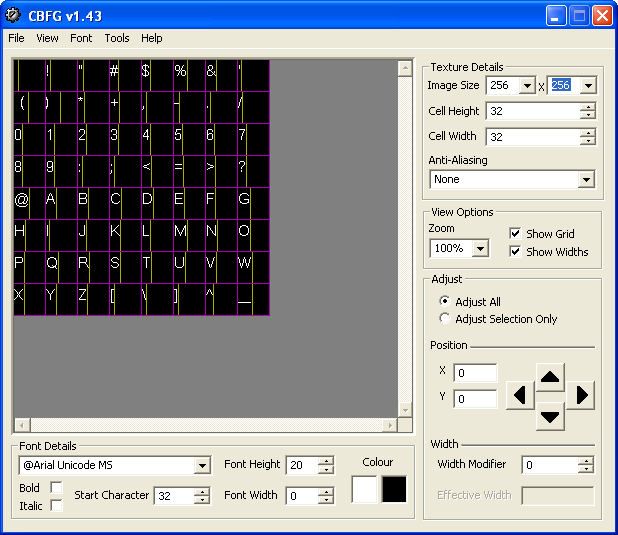 Once we understand how a character is being mapped to the MicroView’s screen buffer, we can choose to manually draw a font to the screen buffer or, alternatively, we can use software to convert a computer’s font to bitmap and then convert the bitmap into C char definition used by the MicroView library. We have had good results using Codehead’s Bitmap Font Generator to convert a font into a bitmap. If you have had success with using other tools, please let us know, and we’ll update this article. Select “Courier” from the Font Details dropdown combo box. Enter 48 as the Cell Height. Enter 12 as the Cell Width. Enter 128x32 as the Image Size (this Image Size need to be larger than 12x24x10(number of characters) ). 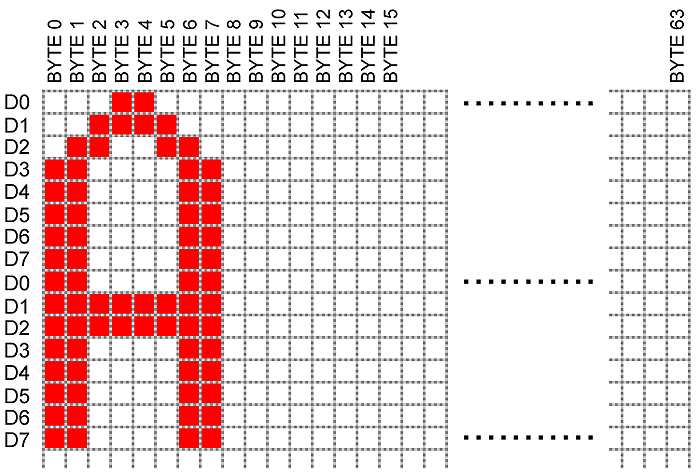 Enter 48 as the Start Character (48 ASCII code is the number 0). Enter 200% as the Zoom. From the generated result, it is clear that there is too much space on the left of the numbers and the glyphs are not taking full advantage of the 12x48 pixel cells. This result is almost perfect except there is still empty space on the right of the “9” glyph and at the bottom of all the numbers. We can’t further improve the font spacing in Codehead Font Generator because it doesn’t allow custom image sizes, so we’ll correct the font in an image editor later. 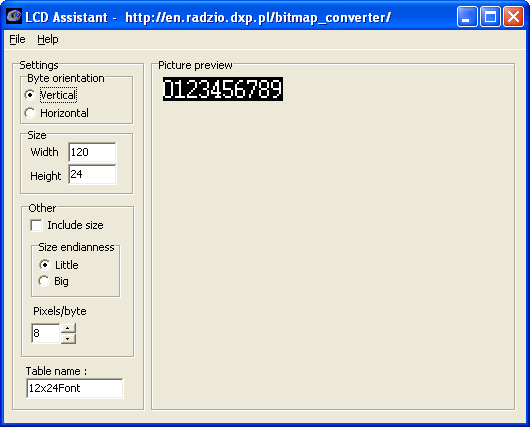 Click File, then Export Bitmap (BMP), save the file as 12x24Font.bmp. Using an image editor like Photoshop or GIMP, open the 12x24Font.bmp file, then make a selection to crop a 120x24 frame from the image. If you want a WHITE text on BLACK background, you will need to INVERT the color now. Save the image and then proceed to next step. You can also save the hassle by downloading the 12x24Font.bmp already prepared by us. You have now successfully created a customized bitmap font! In order to convert the font from bitmap to C char definition, we will be using LCD Assistant. Run LCD Assistant and load the 12x24Font.bmp file previously saved. Picture preview is the right bitmap. Byte Orientation has Vertical selected. Width is 120, and Height is 24. Size Endianness has Little selected. Table name is 12x14Font (can be any name). 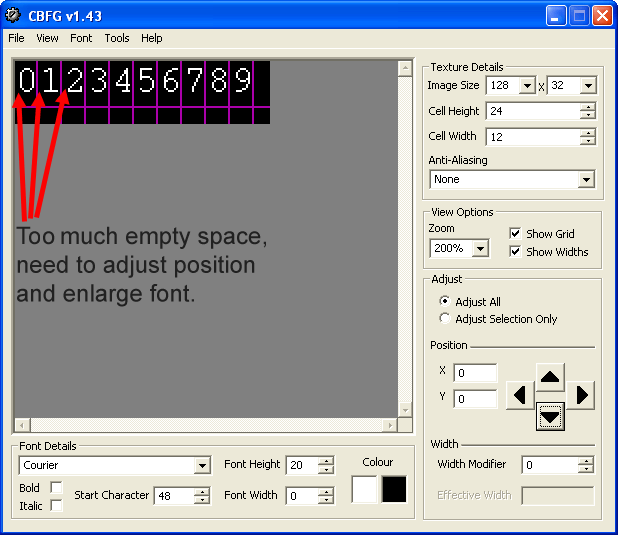 Once all the options are correctly selected, click File, then save the output and type in the filename as 12x24Font.h. Using a text file editor, open 12x24Font.h. FONT MAP WIDTH is basically the WIDTH of the BITMAP file used to generate the fonts. In this situation, the WIDTH of the BITMAP file is 120. So the HIGH number is 1, and the LOW number is 20. You have now successfully converted the bitmap font to a C header file! Move the edited 12x24Font.h file to MicroView’s library folder. 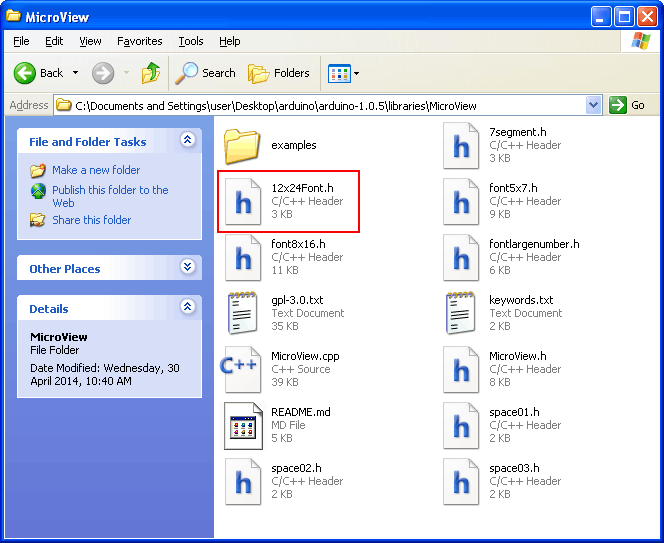 You should be able to see the 12x24Font.h in the same folder as the rest of the MicroView’s files. // Add header of the fonts here. Remove as many as possible to conserve FLASH memory. The font that we have just added is at the 7th position starting from position 0 (font5x7) in the MicroView::fontsPointer array; therefore, the new font is now fontType 7. Save MicroView.cpp once you have made your changes. You have now successfully hacked MicroView's library to add your own custom font!